Growing traffic: The waiting lounge of the Bangalore airport. New Delhi: GVK Power & Infrastructure Ltd is in talks with investors to sell a stake of up to 26% in its airport subsidiary to raise as much as ₹ 3,000 crore after becoming the largest stakeholder in the Mumbai and Bangalore airports. The extent of dilution in GVK Airport Developers Ltd will depend on the valuation and negotiations with investors, George said. He hopes to raise ₹ 2,500-3,000 crore in return for selling a 25-26% stake. By that estimate, GVK’s airport business will be valued at ₹ 10,000-12,000 crore. On Wednesday, GVK Power and Infrastructure increased its stake in Bangalore International Airport Ltd to 43% from 29% by buying 53.8 million equity shares from Siemens Project Ventures GmbH for ₹ 613.82 crore. The infrastructure firm had a day earlier acquired a majority stake (50.5%) in Mumbai International Airport Ltd by buying a 13.5% stake from Bid Services Division (Mauritius) Ltd for $231 million (Rs 1,147.9 crore). The proposed sale of as much as 26% of the airport unit suggests GVK may be looking for a strategic partner that would get a seat on its board and participate in decision making. In restructuring its airport business, the company is following a strategy similar to the one executed by rival GMR Infrastructure Ltd, operator of the Delhi and Hyderabad airports, which raised $330 million this year by issuing compulsorily convertible preference shares to private equity investors. GVK Airport Developers is conducting a feasibility study for the rights it has won to build airports in Bali and Java in Indonesia even as it seeks to cash in on expanding air traffic in India, the ninth largest and fastest growing aviation market in the world. India is expected to be among the top five aviation markets in the next 10 years with domestic air traffic expected to touch 160 to 180 million passengers per annum and international traffic to exceed 80 million passengers, according to the civil aviation ministry. Unlike airlines struggling with rising competition and costs, airport operators in India have been sealing financial deals despite an ongoing fight with the regulator on airport tariffs, including development fees that they collect from passengers. The Airports Economic Regulatory Authority says passenger interests need to be kept in mind while providing for a fair return on investment to airport operators. 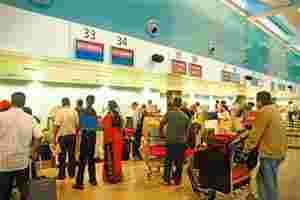 GMR Airports Holding Ltd has attracted investment from Standard Chartered Private Equity (Mauritius) III Ltd, JM Financial-Old Lane India Corporate Opportunities Fund I Ltd, JM Financial Trustee Company Pvt. Ltd, JM Financial Products Ltd and Build India Capital Advisors LLP. The financial transactions, said a government official who declined to be named, disprove the “regulatory risk" that airport operators claim they face. GVK’s George said the regulatory policy will be challenged. “There are places (where) we can go to appeal against it. It has still not been implemented. We are fighting (it) out," George said. Potential returns and strong passenger traffic growth are drawing private equity investors to Indian airport operators, said an executive at an international airport operator who declined to be named. “PEs value the relative stability and prospective growth of airport investments," this official said. “Many of them view airports as a licence to print money while underestimating their complexity and regulatory limitations. Nevertheless, the high growth, particularly in emerging markets or cash cow status in more mature markets, make them relatively safe and lucrative assets for PEs as well as pension funds," this executive said.